I struggle every year trying to think of gifts to give my aging parents. They don’t need anything and don’t have room for presents that will end up being junk that will end up in my house taking up space or will be donated to Goodwill all too soon. Home Instead Senior Care has a very good list of things seniors will truly appreciate for gifts. I’ve also added some ideas and elaborated on some. Take a senior shopping. Make it a special day by taking your loved one to a favorite store or create an online shopping experience he or she won’t forget. My mom and I had a very nice day looking on line at various presents for her grandchildren. She chose something she could engrave with a special saying and their initials. What a treat that will be for the grandchildren to have a present so lovingly picked out and customized for them. They will treasure it for the rest of their lives and always remember the Nana who loved them unconditionally. Lend a hand. Carry on the holiday cooking traditions, asking the senior to help where he or she can. Or ask people to bring their favorite dish. My son who is in college is cooking for a fraternity friendship meal. The dish he chose to cook is a favorite of my Dad’s. He called Papa for the recipe and enjoyed hearing the story about how that became his favorite dish. I love seeing the traditional favorite recipes passed down through the generations. Wrap and send packages. 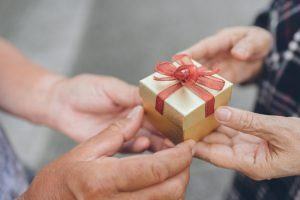 Arthritis can make wrapping those holiday presents a challenge; so too can shipping gifts to loved ones afar. Why not schedule a gift-wrapping afternoon, complete with hot chocolate, cookies and plenty of family stories? Including your loved one in the wrapping process keeps them involved in the season of giving. It’s easy to press “add to cart” and “order” on line, wrapping makes the gift more personal. Deck the halls. Make decorating a multi-generational activity by sending over the grandkids or great-grandchildren. We all have stockings hand made by my mom. It’s tradition to leave some candy in them each year as “seeds” to ensure there’s more the next year. I’m not sure when that tradition started but it’s the first thing we all check when we unpack the Christmas decorations. The chocolate has melted over the year and is more white than brown but it’s always a treat to savor and brings back memories of last year’s Christmas celebration. We also enjoy looking at all the ornaments that have been passed down through generations and those made by children as school projects. Each ornament has a story and special meaning and by involving all generations in decorating the tree the stories are kept alive. Send holiday greetings. The handwritten Christmas card is one of the most popular traditions for seniors. Offer to spend an afternoon writing greeting cards for your loved one. Who doesn’t love to get hand written cards in the mail. Include more than a signature, it’s a good time of year to catch up on family news and activities. The Christmas Letter has a bad reputation, I love hearing what people have done through the year and what better time to share that news than Christmas? Plan a fun event. Caroling is a fun activity at any age. Why not get a group of your senior loved one’s friends together and serenade other older adults in an assisted living facility or nursing home? If caroling isn’t your thing use old recipes your loved ones made annually and spend the day making cookies. Take plates of cookies to elderly neighbors, friends, church members or to the senior center or Meals on Wheels. Plan a cookie exchange using only recipes handed down by family through the years. Include copies of the recipe and why it’s sentimental to you. Celebrate the reason for the season. Be flexible and change traditions of necessary. For instance, attend an early Christmas Eve service, not midnight Mass. Think about your loved one going to Christmas Eve service. What’s parking going to be like, will it be near the door? What’s the weather, will they have to walk far in the rain snow or wind? Will they have a place to sit? If you plan ahead, it makes the evening much more enjoyable, safer and less stressful for all. Plan your holiday meals at a time that’s convenient for your loved one. Do they fear driving at night? Plan the meal early in the day so they can get home safely and comfortably. Offer to pick them up so they don’t have to drive. GoGoGrandparent is Lyft with special features for seniors. Give them a gift of transportation and independence. Focus on others. Get the entire family involved in gathering supplies for a homeless shelter or serving a holiday meal. Home Instead hosts “Be A Santa to a Senior”, donate gifts to their cause. They then work with Meals on Wheels to deliver the gifts to seniors who may not have family nearby or may not receive any other presents. Stay connected. Help an older adult connect with loved ones far away with the latest technology such as Skype or Facetime. Think how far technology has progressed in your loved one’s life. From party lines and wall mounted phones with long cords and large long-distance charges to seeing loved ones live on a pocket-sized phone that is more computer than phone is phenomenal. It’s also very overwhelming. A little mentoring and patience will make the experience memorable for your senior loved ones. Give the gift of time. Sometimes all an older adult wants is companionship, whether it’s a few moments of the day or driving tour to view holiday lights. Seniors don’t need more stuff, they need quality time with you. Share stories of your past-such as the year the Christmas tree fell and was then held up by the hook in the ceiling or the year you sprinkled oatmeal laced with gold glitter so Rudolph and the other reindeer could find your house in the dark and have a snack. Talk about favorite (or least favorite) gifts or the year the turkey was raw, fell on the floor or was eaten by the dog. Those are the memories on which your loved ones thrive. Make special traditional dishes your loved one loves but may not be getting anymore. My Mom loves the Christmas breakfast casserole and homemade cinnamon rolls made from a recipe I got in a home economics class I took in 8th grade. My Dad loves creamed onions and creamed corn with oysters. They may not be my favorite dishes but if they like them that’s all that matters. They enjoy the special treats far more than presents for which they have no use. If you really want to give a gift your loved one can unwrap consider a WiFi cloud digital picture frame. You can send photos to it real time and it dings when a new one is received alerting your loved one that a new picture has been added. We got our mom a Pixstar frame and sent the frame’s unique email address to all the family. Now they can send photos to Nana as they happen. We sent college graduation photos as our daughter walked across the stage. Imagine getting pictures as they happen of a grandson scoring a goal in soccer, a granddaughter soloing on the flute, a son playing softball. What a fantastic way to keep a grandparent involved in daily events. In the classic A Charlie Brown Christmas, Charlie Brown complains about the overwhelming materialism that he sees everywhere during the Christmas season. 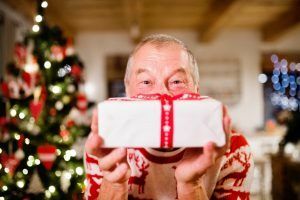 Christmas with Senior loved ones don’t have to be about objects and spending a lot of money. What’s more important is memories, time, compassion, time, stories, time, thoughtfulness, time, tradition time and love (and time).